While Hsp70 and Hsp60 chaperones are the most extensively studied chap-erone systems, there are many other chaperones with distinct cellular functions. These functions include modifying polypeptides after formation by altering the bonds within and between chains. It appears that some chaper-ones, in addition to attempting to rescue partially misfolded proteins, also alert the protein degradation system of the cell to the presence of substrate proteins that are too misfolded for rescue. It is expected, with the explosion of information provided by genome sequencing efforts, that many additional chaperones will be identified in the near future. 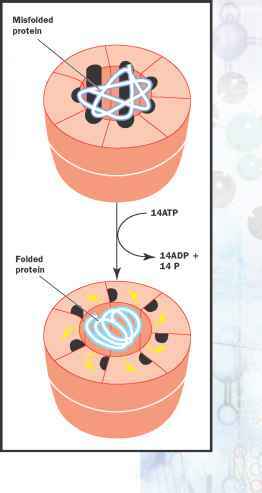 Chaperones use energy from ATP to help misfolded proteins refold properly. 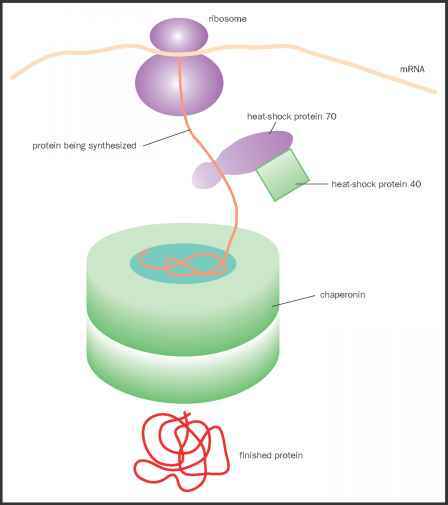 Heat-shock proteins and chaperonins cooperate to fold newly synthesized proteins. The correct three-dimensional conformation is essential for protein function. Adapted from <http://www.nurseminerva .co.uk/chaperon.htm>.